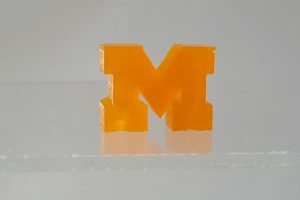 Michigan researchers have developed a new 3D printing approach that lifts complex shapes from a vat of liquid 100 times faster than conventional 3D printing processes. The U-M process does away with the traditional additive manufacturing approach of building up plastic filaments layer by layer. “Using conventional approaches, that’s not really attainable unless you have hundreds of machines,” says U-M associate professor Timothy Scott. Scott was responsible for co-leading the development of the new 3D printing approach along with the university’s T.C. Chang Professor Mark Burns. Their method solidifies the liquid resin using two lights to control where the resin harden – and where it stays fluid. This enables the team to solidify the resin in more sophisticated patterns. The researchers were successful in producing a 3D bas-relief in a single shot rather than in a series of 1D lines or 2D cross-sections. Their printing demonstrations include a lattice, a toy boat and a block M.
This true 3D approach is however no mere stunt. The researchers had to overcome the limitations of earlier vat-printing efforts. For instance, the resin tends to solidify on the window that the light shines through, stopping the print job just as it gets started. The researchers realized that by creating a relatively large region where no solidification occurs, thicker resins can be used to produce more durable objects. The method also beats the structural integrity of filament 3D printing, as those objects have weak points at the interfaces between layers. “You can get much tougher, much more wear-resistant materials,” says Scott. The university has already filed three patent applications to protect the multiple inventive aspects of the approach, and Scott is preparing to launch a startup company soon.